Your feet are your foundation. They directly impact the way your body moves and the way it feels. We repeatedly use them in metaphors—like, “stand on your own two feet”—that talk about strength and confidence, important for reaching your full potential. But how can you put your best foot forward when it’s your foot that’s causing you pain? 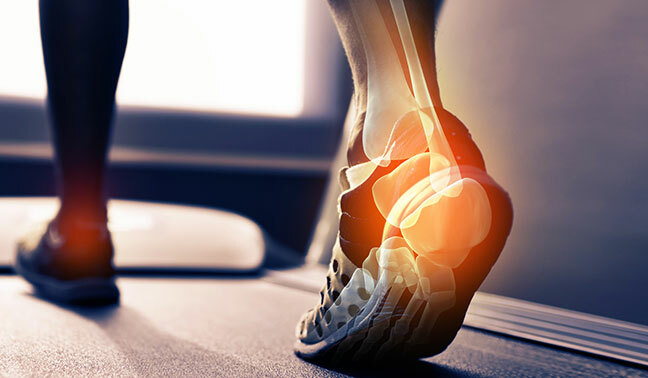 Foot pain, swelling, malformations and balance issues may also influence other parts of your body, sometimes leading to problems in your knee, hips and spine. It’s time to fix the problem, starting at the foundation. Orthotics can help correct and prevent foot pain and other conditions. Here’s what you need to know. 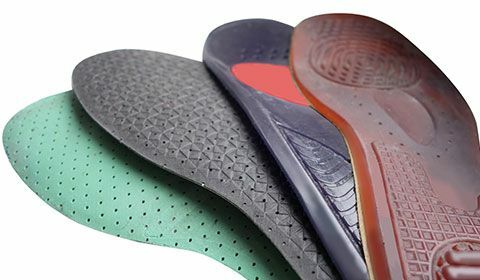 Orthotics, or orthotic insoles, are supportive devices placed in your shoes to restore the foot to its proper biomechanical balance and function. They can help decrease excess motion if you have an over-pronated foot (when the foot rolls inward), which is often called “flat foot.” Orthotics can also help correct high, rigid arches, redistributing your weight more evenly across your foot and providing more shock absorption. Orthotics can be made of a wide range of materials depending on their specific purpose, including cork, leather, graphite, plastic, foam and rubber. When it comes to orthotics, you have two options to consider: off-the-shelf and custom. Off-the-shelf orthotics are readily available in drug and retail shoe stores, so there’s no waiting before you can try them out in your shoes. Plus, they are an inexpensive option, with prices ranging from $30-$100. But you may need to replace them after a year or so of wear. Because there are so many options out there—different arch heights, amount of cushioning, degree of rigidity—it’s still a good idea to consult a healthcare professional, such as a Canadian Certified Pedorthist, to help determine your foot corrective needs. Off-the-shelf orthotics can be good first start to correcting your foot problems. When you’re ready to make more of an investment, custom orthotics are an effective option. Unlike orthotics you can buy at the drugstore, these ones are designed specifically for your foot and are built to last. Following an assessment, a cast is made of your foot using plaster, a foam mold or a 3D-laser scan. This cast is used to create an orthotic with personalized adjustments that target your foot condition. There are two types of custom orthotics: functional orthotics and accommodative orthotics. Functional orthotics focus on helping you regain proper alignment in the bones of your foot as you bear weight on it while walking. They are often made of rigid or semi-rigid materials. Accommodative orthotics are designed to relieve stress on firm or inflexible feet. They tend to be made of softer, more flexible materials than functional orthotics, such as cork, leather, plastic foams, and rubber materials. Individuals with diabetes or arthritis can benefit from accommodative orthotics. If you have foot pain, swelling, malformations or balance issues, your clinician will perform a thorough assessment of your foot, posture and gait using tools such as a computerized gait analysis, video analysis and/or biomechanical foot assessment. This will help them determine if custom orthotics are the right option for you and make recommendations for which type you’ll need. Podiatrist vs. Pedorthist: What’s the difference? Many people hear the terms podiatrist and pedorthist and are confused about who does what. Which one is the foot doctor? Who should I see first? Both podiatrists and pedorthists are highly trained healthcare professionals with education and experience that focuses on feet. However, their education and the tasks they perform are different. Podiatrists have an undergraduate degree (BA/BSc) and a Doctor of Podiatry Medicine degree (DPM). They diagnose and treat foot problems, often prescribing custom orthotics as a part of treatment. On the other hand, pedorthists have an undergraduate degree in kinesiology or related field, along with either a post-graduate Diploma in Pedorthics or a three-year apprenticeship. While your podiatrist may prescribe orthotics, your pedorthist will make and fit the orthotic—or recommend a non-custom, off-the-shelf option. They are trained in the assessment of the foot and lower limb, as well as the design, manufacturing and fitting of foot devices. This includes modifying custom footwear. 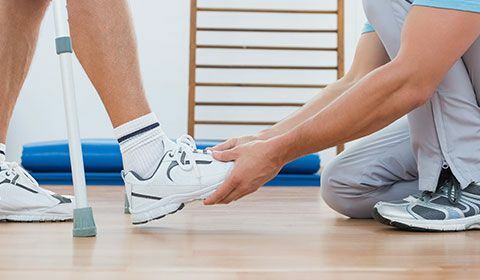 From foot assessments to modifying devices, there are a range of individuals who can help, including podiatrists, pedorthists, chiropodist, orthotists and other clinicians such as physiotherapists or chiropractors. How can orthotics helps my foot problems? Orthotics can help reduce pain in the arch, heel or toe joints, as well as other parts of the body that are affected when your feet aren’t in balance or functioning properly. Orthotics can help correct posture and help you become more efficient at walking, standing, running and sports. Orthotics are a great tool for treating foot pain but only one part of the equation. Combining physiotherapy with the use of orthotics gives you a comprehensive treatment plan. Your physiotherapist can help you regain balance, strengthen muscles and realign structures in your foot. These important changes can be complemented with orthotics, so your recovery moves forward with every step you take—in and outside the clinic. Orthopedic shoes are custom corrective footwear that can be worn with removable orthotics. They are especially helpful if you have a foot deformity, complicated foot injury, wide bunion, open sore, or neurological disease affecting your feet. What is metatarsalgia and why is it causing pain in the ball of my foot?